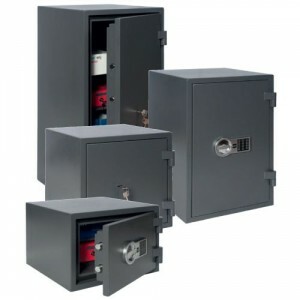 These safes have been tested and certified to rigorous European standards by the ECB-S. Burglar resistance is rated to S2 under the EN 14450 standard, meaning these safes can be used to store up to £4,000 in cash or £40,000 in valuables overnight. Perfect for small, expensive items such as electronics, they are constructed from robust steel and feature three-way locking bolts which seal the door at the top, side and bottom. A VdS certified electronic lock is fitted as standard, providing both security and ease of use. A reinforced plate around the lock helps fend off drill attacks. Fire resistance has been tested to the LFS standard. The Carbon S2 provides 30 minutes protection for papers, making it perfect for storing bank statements, insurance forms, birth certs, passports or other important, personal paperwork. The interior of each safe is fitted with a convenient drawer, great for keeping smaller items organized and tidy. On larger models, this drawer can be locked for increased security. Shelving is standard across the range, allowing you to maximise the storage space. A stylish anthracite black/grey powder coat finish gives the Carbon S2 a striking but understated look that fits well into any home or office environment. Four sizes are available, ranging from the small and compact Size 1 to the large capacity Size 4.